As we approach the tenth anniversary of the September 11 World Trade Center attacks (has it already been ten years??) countless hearts and minds will be remembering the fateful day our world changed forever, and the many people who tragically lost their lives in the catastrophic collapse of the twin towers. Memorial events will be held in many locations around the world… and even, in a small yet poignant way, on another world. For, unknown to many, two pieces of the World Trade Center are on the surface of Mars: one affixed to the rover Spirit which sits silently in its permanent position near a small plateau called “Home Plate” and the other on its sister rover Opportunity, currently exploring the rim of the vast Endeavour crater. Much more than scientific exploration tools, these rovers are also interplanetary memorials to the victims of 9/11. 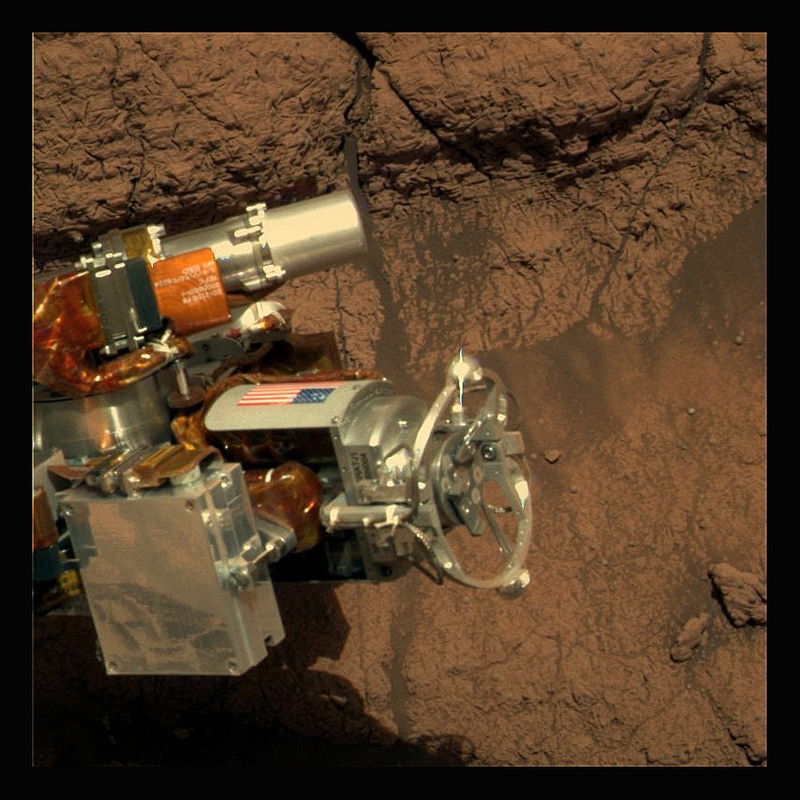 The image above, taken in 2004, shows the cable shield with American flag on the Rock Abrasion Tool attached to Spirit. Read the full story by Keith Cowing on OnOrbit.com. Do you think this political B.S. link belongs here in a comment section about a memorial on a Martian rover? You are a loser. Government made 9/11 happen, and now they are having a memorial day every year? How hypocritical. It is most definitely USA political/Pentagon propaganda on planet Mars with the MER rovers. The MER 9/11/01 monuments are not appropriate for a planetary science mission to Mars! Mars Attacks? These are not political “monuments”, these are memorials by the people who worked on the components of the rovers and had their lived directly affected by the tragedies of that day. It is by them, for them, and also for all of us, past, present and future. These rovers are our generation’s legacy on Mars, it’s only fitting that they hold a piece of what shaped our society. Politics aside – this is an amazing tribute to the American spirit!! Way to go! Previous PostPrevious Report Earthquakes for Science!